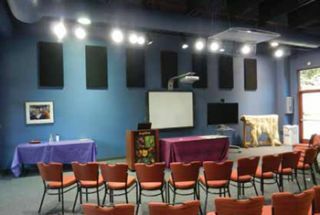 Primacoustic panels improved acoustics and intelligibility for the distance learning programs at the Memphis Zoo.MEMPHIS, TN—At the end of 2011, the Memphis Zoo transformed its Discovery Center building into a distance learning facility, using funds awarded for the purpose by the United States Department of Agriculture (US DA). The Dotty Griscom Distance Learning Laboratory (DGDLL) is used by the zoo’s Education Department and other departments as a classroom and meeting space, and is also available for meetings by corporations and government entities. The Memphis Zoo received a $500,000 grant under the Distance Learning and Telemedicine Grant Program administered by the Rural Utilities Service in 2011, which the zoo’s Education Department applied toward a nanotechnology program, dubbed “NanoZoo Connects.” According to a statement from the zoo, the program was designed to initially reach approximately 7,000 students in 14 rural Tennessee schools through distance learning technology. The grant allowed the zoo to outfit a distance learning studio as well as a large classroom at the DGDLL. Audio playback is via a FrontRow Pro Digital system, with wall speakers and IR sensors. A ceiling-mounted Tandberg AudioScience pressure zone microphone kit with fiberglass boundary assembly picks up the audience while a second mic is available at the podium or at a desk, said Robinson, who worked with Michael Lay, education sales consultant at PCS, a Cisco reseller in Louisville, TN, that supplied and installed the equipment. Memphis-based Running Pony Productions installed a video package in the production studio, which includes chroma key capabilities, two Tandberg PrecisionHD cameras, a pair of 46-inch flat panel Samsung televisions, and a NewTek Tricaster TCXD 300 HD production environment.